Does Shamanic Snuff Cause Cancer? Rapé – pronounced ha-PAY (and also spelled “hapeh” by gringos who can’t get over that it’s spelled with an “r” but pronounced with an “h” in Portuguese) – is a sacred shamanic snuff you blow up your nose. It has been used ritualistically by tribes in the Amazon basin for thousands of years for healing, social and spiritual purposes. Rapé is made of powdered medicinal plants, often with a tobacco base, and is considered to be sacred. Nowadays, this ancient practice is making its way around the world, as modern shamans and plant medicine enthusiasts are introduced to the sacred snuff while visiting the Amazon, or attending ayahuasca ceremonies in their home countries. With the success of anti-smoking campaigns around the world, most of us are aware of the dangers of smoking cigarettes. So naturally, the question arises, does snorting dry tobacco snuff up your nose also cause cancer? When it comes to assessing the risks of dry nasal snuff use, the oldest population of snuffers – the indigenous peoples of the Amazon basin – has escaped Western scientific scrutiny. Shamanic snuff goes back to pre-Colombian times, and while people in the Amazon continue to insufflate tobacco-based snuffs, in all these hundreds of years, no scientific studies have been made to determine whether the indigenous populations have ever developed nasal or lung cancers from this ancient practice. Amazonian peoples used and continue to use these snuffs to treat a wide variety of ailments, from general listlessness to digestive issues and respiratory infections. Shamanic snuffs were never a mass market product – they were made in small batches by shamans for specific medicinal purposes. Amazonian shamanic snuff is typically produced from organic, wild-crafted ingredients. Most consumers of shamanic snuff in the Amazon do not even smoke cigarettes. In 1566 the Queen of France was convinced that it cured her migraines. Napoleon sniffed over 7 pounds of snuff a month. In 1624 Pope Urban VIII threatened excommunication for snuff users, because sneezing was thought to be too close to sexual ecstasy. While there was a brief period of time in Western civilization where dry nasal snuff was the rage until the 19th century; this practice eventually died out and was replaced by chewing oral wet tobacco (also referred to as “snuff”) and cigarette smoking. Today, people who regularly consume smokeless tobacco account for less than one per cent of all tobacco users, and those who consume dry nasal snuff are an even smaller subset of snuff users. Scientific research into the health risks of tobacco use have focused on these 2 most common forms of consuming tobacco – smoking and chewing. Both these methods of consuming tobacco have been extensively researched and found to cause cancer in the long run. If one were to observe the rate of abuse related to the different ways of consuming tobacco, smoking has the characteristics of a pandemic, the use of smokeless tobacco could be defined as endemic, and that of nasal snuff – sporadic. For this reason, there are very few clinical reports on the health risks of dry nasal snuff, because of the limited spread of dry nasal tobacco abuse today. Did Indigenous People Get Cancer from Using Tobacco Snuff? Not that we know…and it seems highly unlikely given its long-standing use. If consuming tobacco-based shamanic snuff was a cancer-causing practice, the indigenous people surely would have picked up on it hundreds of years ago. Indigenous people also had a different relationship to tobacco than Westerners. Firstly, they traditionally considered tobacco to be a sacred plant medicine. Secondly, shamanic snuff is consumed ritualistically, usually with one person, say the shaman, administering it to another individual using a blowpipe; it is not really consumed on the sly, as a habitual personal vice in the way cigarettes are typically consumed. Furthermore, indigenous tribes used a different kind of tobacco to make their medicine, and they rarely smoked it. The tobacco used by indigenous tribes for healing purposes is nicotiana rustica – also known as mapacho – and while it is considerably stronger than the tobacco used in commercial cigarettes (nicotiana tabacum), mapacho smoke was rarely ever inhaled. If it was smoked, it was typically smoked into the mouth like a cigar or a peace pipe, with the smoke blown over a patient as a blessing. From the 2500 to 3000 different chemical substances inhaled when smoking, polycyclic aromatic hydro-carbons, the tobacco-specifc nitrosamines nitroso-nor-nicotine (NNN), 4-(methylnitrosoamino)-1-(3-piridyl)-butanone) (NNK), carbon monoxide, ana-basine and cotinine are related to higher cardiovas-cular risk. All of the components of smoking that lead to cardiovascular disease, such as fibrinogen, are all greatly reduced when insufflating dry smokeless tobacco. Snuff has shown no effect on promoting atherosclerosis or myocardial infection. The effects of smoking has been widely documented and researched to the point where it is widely known that long-term smoking significantly increases risks for cancer. In smokers, there is a four-fold increase in risk for head and neck related malignant cancers. By contrast, there is no convincing evidence that dry tobacco snuff increases risk of head and neck cancers. There is strong evidence that the carcinogenic aspects of smoking is created when heat is applied to the tobacco. Obviously, a snuffer of dry nasal tobacco is not exposed to any of these chemicals, which are all induced through burning. There are, however, some carcinogenic compounds still present in smokeless tobacco, even without the application of heat. Carcinogenic chemicals called “nitrosamines” are still present in dry nasal snuff. In fact, in many cases the concentration of nitrosamines are higher in the form of snuff. However, the existing clinical evidence of nasal snuff as a carcinogenic factor in the nose and the paranasal sinuses is not convincing. A recent study of 63 regular long-term snuff users in England had no signs of malignancy. In Africa, an elevated incidence of carcinomas of the maxillary antrum in snuff users was described in South Africa Bantu, and data shows that consumption of Zulu snuff make increase the risk of cancer; in both cases, it’s suspected that the addition of charred aloe stems (which gives a higher level of the carcinogenic benzpyrene to the tobacco snuff) is responsible for this effect. The risks of adverse health outcomes depend on the type of smokeless tobacco used in a specific region of the world – whether it’s dry or moist, whether there are any additives, and what those additives are. Nicotine is the main psychoactive in tobacco. Nicotine is typically considered the main culprit for the addictive tendencies associated with smoking. While nicotine is addictive, it is not carcinogenic. However, the cigarette industry has manipulated the nicotine content of smoking tobacco to create more dependency…in order to sell more product. Cigarette dependency results in continued exposure to the carcinogenic compounds created when tobacco is burned and the smoke is inhaled. Because tobacco-based Amazonian shamanic snuff is made with nicotiana rustica, it contains more nicotine than cigarettes, and therefore can be habit forming. Can Shamanic Snuff Help Ease Your Cigarette Addiction? The smoking cessation industry is a billion dollar industry touting a wide range of products that help you to “quit smoking”, everything from electric cigarettes, to patches and pills. Smokeless tobacco has the benefits of eliminating the smoke-related health risks, proponents of smokeless tobacco advocate for its use as a smoking cessation tool. Though nasal sniffing of dry snuff remains a rare practice, shamanic snuff may be actually be one of the safest cigarette alternatives, free from the dangers of synthetic ingredients often included in products designed to help you quit smoking. Many of the products designed to help people quit smoking utilize nicotine replacement therapies. Though the nicotine is absorbed a little differently, the high associated with smoking is mimicked when you use tobacco snuff. However it’s been found that 24 hours later, the concentration of nicotine in the blood is lower than it is with smoking, resulting in lower negative impact on the biomarkers for cardiovascular disease. In other words, you get the nicotine high with lower risk of heart and lung disease. Because shamanic snuff from the Amazon is a dry nasal snuff made from organic, wild-crafted tobacco and medicinal plants, its cancer risk is extremely low. While potentially habit forming due to its high nicotine content, there is currently no clinical evidence that this type of dry, smokeless tobacco causes lung cancer, nasal cancer or heart disease. Rapé is considered to be sacred in the Amazon, so as with any sacred plant medicine, it’s best to use it mindfully, and with respect, to unlock its healing and spiritual benefits. 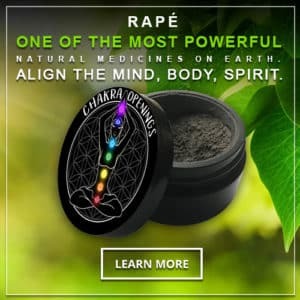 To learn more about how to use shamanic snuff in a safe, ceremonial, and non-abusive way, check out the Modern Shamanic Guide to Rapé. Smokeless tobacco: is it really safe?